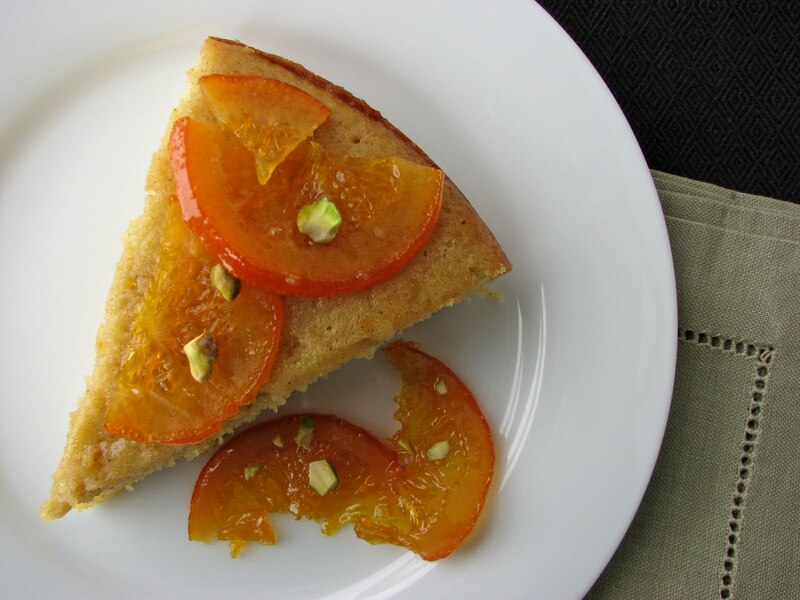 There is a long tradition of semolina cakes in the Middle East and the Mediterranean that benefit from a dousing of syrup usually made from honey. There are varying ingredients and shapes and flavors that have endured through history but all are celebrations of culture and sharing. And though there are many wonderful variations, this particular Olive Oil Cake with Candied Orange is so deliciously constructed it rises to the top of most other cakes I’ve had in this genre. 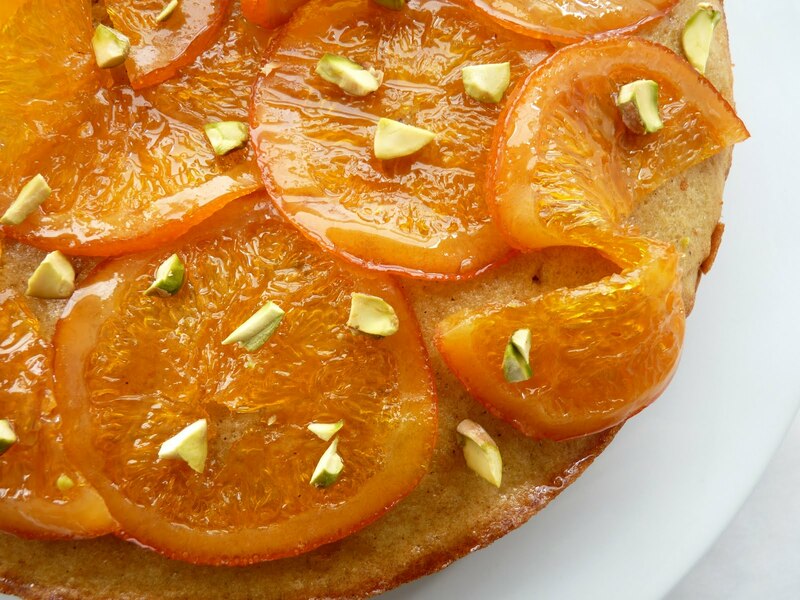 The cake is enriched with olive oil and yogurt and lightly scented with cardamom and orange zest. There’s just a bit of interesting texture provided by semolina. But it’s the crowning touch of oranges that get candied in a sensational aromatic cardamom orange syrup that really sets it apart. It’s festive and beautiful and full of wonderful flavor that only the happy combination of all these great ingredients can provide. Next time you're in search of a delicious dessert to share with friends and family, try this splendid cake. It's certainly befitting as the grand finale to any delicious feast where adventure is the centerpiece. - I didn't have any trouble inverting the cake but you may want to either leave the cake on the bottom of the springform pan or be extra careful if you soak the cake with the full recipe of syrup. - Semolina is available at better supermarkets, Italian markets or in bulk food groceries. - Use a very sharp knife to cut the oranges into thin slices. - The syrup and candied orange slices can be made a day ahead. Pour the syrup into an airtight container and place in the refrigerator. Store orange slices separately. Warm the syrup just a bit before using. - Choose a good olive oil for the cake. I used a delicious Arbequina extra virgin olive oil from California Olive Ranch. - The cake has only 1/2 cup of sugar in it because the syrup sweetens and moistens it. 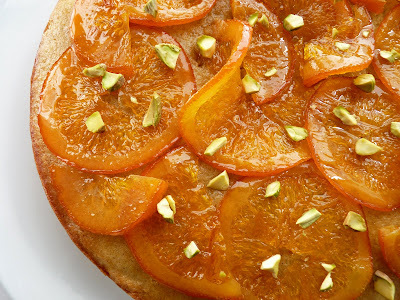 - For better ease of serving after presentation, set some of the candied oranges on the cake aside so you can slice it. Garnish each plate with some of the orange slices. 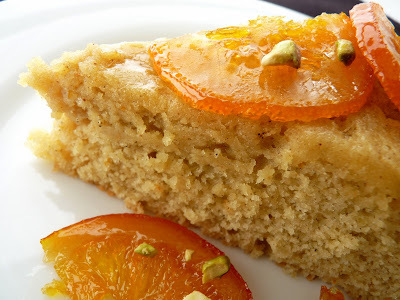 - If you like the combination of orange and cardamom, also try the Orange Cardamom Cake. For the candied orange and syrup, line a baking sheet with parchment paper or a silpat. Cut the orange into thin slices. Bring sugar, water, honey and cardamom pods to a boil until sugar dissolves. Add orange slices. Reduce heat to medium low. Simmer, turning orange slices occasionally, until they are tender and the syrup is reduced to 3 1/4 cups. This will take about 30 - 40 minutes. Arrange orange slices in a single layer on prepared baking sheet. Strain syrup. Set aside. For the cake, preheat oven to 350 degrees. Brush a 9" springform pan lightly with oil. Line the bottom with parchment paper. Whisk together flour, semolina, baking powder, baking soda, salt and ground cardamom. Separate the eggs. Beat the 1/2 cup oil and 1/4 cup sugar for 1 minute. Add the yolks and combine thoroughly. Add flour mixture and beat until blended. Beat in yogurt, zest and vanilla. Set aside. Using a clean dry whisk attachment, beat egg whites in another bowl until opaque and soft peaks form. Gradually add the remaining 1/4 cup sugar and beat until firm peak stage. Gently fold egg whites into cake batter in 2 additions. Transfer to prepared pan and smooth the top. Place the cake pan on a wire rack. Pierce hot cake with a toothpick. Slowly drizzle 3/4 cup warm syrup over the top of the cake. When syrup is absorbed, slowly pour 3/4 cup more syrup over. [I skipped the second application of syrup.] Reserve remaining syrup for serving. Cool completely. Run a thin knife around edge of pan to release cake. Remove pan sides. Carefully invert cake onto a plate and remove parchment paper. Invert again onto a serving platter so it’s right side up. Arrange candied orange slices over the top. Garnish with pistachios. Serve drizzled with more syrup, if desired. This looks beautiful, and I love orange cakes. We are at the very end of your pecan cookies. They were totally delicious; everyone loved them. An exceptional cake with aromatic and seasonal oranges. Just lovely! This looks really gorgeous. I can imagine how fragrant it is, too! Love this! Doing alot of olive oil baking these days. Thanks for this one. 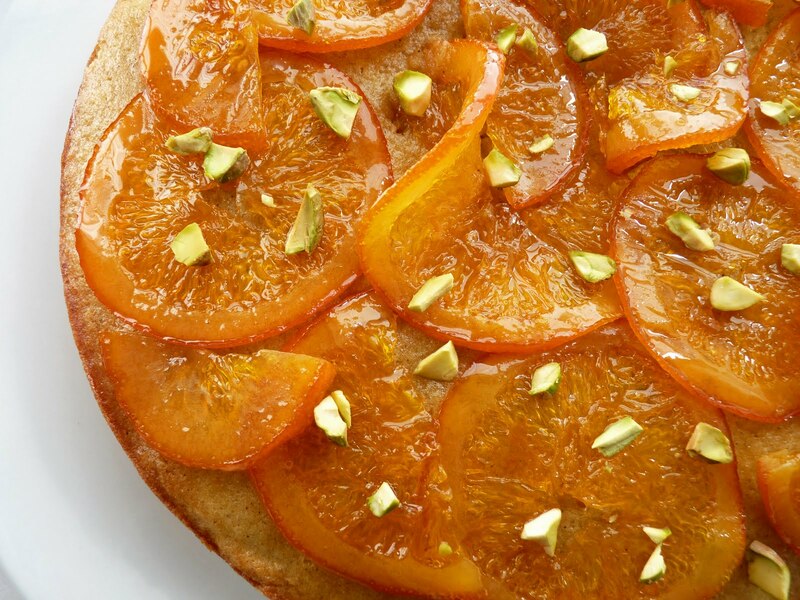 Love the candied orange....I've made a similar cake, but it had fresh fruit served with it as I recall. Really like this idea! Healthy and delicious food. Surely it will boost your immune system this coming holiday season. This looks really incredible - my mouth is watering bigtime! These pictures itself are inviting. Thanks for sharing a healthy and tasty recipe. I made this last weekend. Couldn't find unsalted pistachios so substituted toasted pine nuts. The cake was lovely! I cut the syrup dose to about 2/3 and it was sweet enough. The olive oil was subtle but present, and the layers of cardamom and orange flavours were wonderful. I'll make this one again for sure. Hey slowcoast.ca, so good to hear you enjoyed this cake. It's pretty special. I like your idea of using pine nuts. Cheers!! I just wanted to let you know that I made this cake a couple of days ago, and it was INCREDIBLE. This is what mine looked like! Thanks so much for a great recipe, and I hope you don't mind me linking to it from my blog! Elly, your cake is really gorgeous! I love the stunning effect of blood oranges. They're just coming into season here. It's a pretty terrific cake and I can only imagine how much better it would be with Moros. Your blog is beautiful. I think we have very similar palates! Thanks so much for the link back. Thank you very much, Anonymous! Yes, you can make the candied oranges in advance. If made a day ahead, store them separately from the syrup. They will also keep for a long time stored in the syrup in an airtight container in the refrigerator. They do begin to change in texture over time, softening and becoming a bit sweeter. I'm making a similar cake today. Mine is in a bundt pan, currently cooling. Can't wait to see how it looks when I turn it out. Thanks for the inspiration. Great blog! Thank you very much, Karina, and enjoy your cake!